There has been a lot of talk about iBeacons since they launched with iOS 7 last fall, but much of the focus has been on how they benefit retailers and add to the in-store shopping experience. They have a much broader range of potential use, however, and part of that is consumer-focused, too. Placed is a new app that shows you how iBeacons might benefit anyone at home, by tying iBeacons to specific apps and offering quick-launch capabilities. What does that mean exactly? Well, if you walk into your kitchen and pass an iBeacon attached to your oven door, your iPhone could wake and automatically launch a kitchen timer app. Opening the fridge could call up a grocery list, and sitting down in the living room to enjoy some Netflix on Apple TV could open your Remote app. In other words, Placed could turn your iPhone into a contextually aware, automatic Swiss Army knife of mobile software that responds instantly to your environment. If your phone is locked and you’re near an iBeacon that has been assigned to an app supported within Placed (or to a custom launch URL of your choosing), it’ll push a notification to your phone telling you where you are and what software you’re going to trigger. You then swipe that notification to launch directly into the app. Currently supported apps with built-in functionality in Placed include Remote, Timer, Waymate, Wunderlist, Safari and Fantastical, but any apps that support launch URLs can be added manually, and the Aww Apps team that built Placed is working on adding more presets soon. To get set up, you’ll need some kind of iBeacon hardware, which you can hack yourself with a Raspberry Pi and a Bluetooth LE transmitter, or make using unused iOS hardware and specific apps. The easiest way is to pick up some pre-made iBeacon hardware, like the Estimote Beacons that startup currently offers in a dev kit of three units for $99. 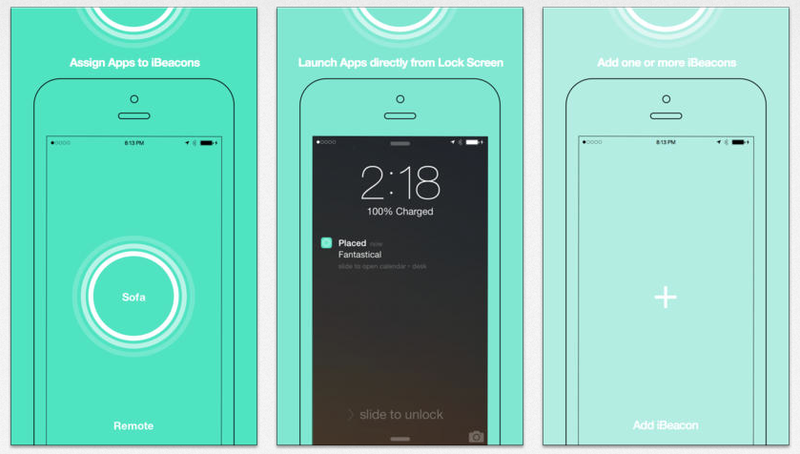 The notifications for Placed will trigger when you’re within a meter (three feet) or so of your iBeacon hardware. The app itself is $2.99. This is an early example of how we might eventually uses embedded BLE Beacons in-home to automate a lot of tasks based on proximity, but it’s a powerful example of what iBeacons brings to the iOS ecosystem which you can check out right now with a relatively low barrier of entry.